Air Conditioning, Power Windows, Locks and Steering, Satellite, Keyless Entry, Alarm, Daytime Running Lights, Active Seat belts; All Wheel ABS, Back Up Camera, Heated Front Seats. Interested in purchasing this vehicle? Calculate your payments using our easy finance calculator! Back-Up Camera, AC, Cruise, MP3 Capable, Power Locks, Mirrors, Steering and Windows, Running Boards, Full Factory Warranty. 4x4, 21 MPG HWY, 18 City, Bed Liner, BT, SXM ready, Steering Wheel Audio Controls, Cruise, PW, PL, Compass, Outside Temperature Control, Running Boards. White Diamond Tricoat exterior with tan leather seating, chrome accents, great color combo! AWD, Ultra View Sky Roof, Power Everything, Multi-Disc, Heated Front Seats and Mirrors, Auto Climate Control, Memory Seats, Turbo, Rear Parking Assist, Leather, USB Port. Come see this vehicle before its gone! 4x4, Dual Zone A/C, Heated Mirrors , Front Seats and Steering Wheel, Navigation System, Rear Parking Aid, Remote Engine Start, Back-UP Camera, BT, Cloth and Leather Seats, Bedliner, Tonneau Cover, Side Steps, Power Everything, Sun-Roof, Tinted Windows, Keyless Entry, WiFi Hot Spot. 4x4, 21 MPG HWY, 18 City, Bed Liner, Tonneau Cover, Bluetooth, SXM ready, Steering Wheel Audio Controls, Cruise, PW, PL, Compass, Outside Temperature Control, Running Boards. AWD, Back-Up Camera, BT, Dual Zone Climate Control, Heated Front Seats, Leather, Satellite Radio Ready, Woodgrain Interior Package, Tinted Window, Tilt/Sliding Sunroof, Keyless Entry, Cargo Shade. AWD, Aluminum Wheels, Brake Assist, Integrated Turn Signal Mirrors, Keyless Start, Leather Seats and Steering Wheel, Power Doors, Front Seats, Mirrors and Windows, Privacy Glass, Rear Parking Aid, TPMS. Heated Seats and Mirrors, 3rd Row Seating with Stow and Go, Multi Disc/CD with AM/FM and Satellite Radio Ready, Rear Parking Assist, Auto Climate Control, Roof Racks, USB and Aux in Ports, Double Sunroof. 2.0L Turbo, Tow Package, Auxiliary Audio Input, Back Up Camera, Blind Spot Monitor, Bluetooth, Panoramic Roof, HID Headlights, Heated Leather Seats, MP3 Compatible, Navigation System, Power Rear Liftgate, Remote Engine Start, Premium Stereo, Memory Seats. Come check out this fully equipped family SUV before its gone! This has every option you will ever need. 4x4, 21 MPG HWY, 18 City, Power Leather Seat, Bluetooth, SXM ready, Steering Wheel Audio Controls, Cruise, PW, PL, Compass, Outside Temperature Control, Back Up Camera, Running Boards, Navigation. 2 Passanger, Power Windows, Locks and Mirrors, AC, Hard Top, Running Boards, MP3, Tilt Wheel, AM/FM, Trunk Mat. Full Factory Warranty! Off Lease, Back Up Camera, Running Boards, Bedliner, 4x4, 21 MPG HWY, 18 City, Power Seat, Bluetooth, SXM ready, Steering Wheel Audio Controls, Cruise, PW, PL, Compass, Outside Temperature Control. Power locks, mirrors, windows, seats, and Sky Slider Canvas Convertible Roof, Infinity sound system, Hill Start assist, 4x4 with high and low, steering wheel controls, SXM ready, Aux In. Power locks, mirrors, windows and sunroof, Infinity sound system, Down hill assist, 4x4 with high and low, steering wheel controls, SXM ready, Aux In. Full Factory Warranty. AWD, Back-Up Cam, BT, AM/FM/CD player. Heated and leather front seats with memory settings, navigation, rear parking aid and lane assist. Power Locks, Mirrors, Windows, Seats, Push Button Start, Tinted Windows, Turn Signal Mirrors, Universal Garage Door Opener, and much more! AC, Tilt Wheel, Power locks, mirrors and windows, Stuffed right up! Come check it out before this special order is gone. Bluetooth, keyless entry, 40 mpg! 4x4, 3rd row seating, aux-in, back-up camera, dual moon roof, dual zone climate control, heated mirrors and front seats, leather, navigation, rear parking aid, power everything. Auto Leveling Headlights, Back-Up Camera, Blind Spot Monitor, Dual Zone A/C, HID Headlights, Heated Mirrors and Seats-Front(s),Navigation,Premium Stereo, Rear Parking Aid, Seat Memory. 4x4 w/ Off Road Terrain Management, Power doors, windows, locks, mirrors and seats, Steering Wheel Controls, Sync w/My Ford, Bluetooth, USB & Aux in, 3rd Row Seating with fold down seats, Navigation, Loaded! 4x4, Heated Steering Wheel, Seats and Rear seats, Remote Car Starter, Back Up Camera, Leather Seating, Select Terrain System, Keyless GO, Bluetooth, 5.0" Touchscreen, 8 speed automatic transmission, Navigation, Adaptive Cruise Control, Panoramic Roof, Stuffed to the max! Fully loaded special order!!! High value items include: Back-Up Camera, Heated and Cooled Seats, I-Pod Integration kit, Bed Liner, Hard Top, Leather, BT, Satellite Radio. Auto Leveling Headlights, Aux In, Bluetooth, Dual Zone A/C, HID Headlights, Heated Mirrors, Front Seats, Panoramic Roof, Seat Memory, Leather. All stuffed up and ready to go! AC, Tilt Wheel, Power locks, mirrors and windows. Special order, come check it out before it's gone. SRW, Lariat Ultimate Package, Black on Black, 6.7L V8 Turbo Diesel, Navigation, Sunroof, Power Seats, 4WD, Hill Start Assist, FX4, Rear Locking Differential, Chrome Package, Heated & Cooled Seats, Remote Car Starter, Sliding Rear Window, Sony Stereo System. 2SS, Heads Up Display, Sunroof, Back Up Camera, SWEEET! 1-Owner, Blind Spot Monitoring, Adaptive Cruise Control, Keyless GO, Power rear liftgate, HID lighting, Navigation, Leather, Sunroof, Heated and Cooled Seats, memory seating, Lexus Inform Apps, Coming Soon. 4X4, AM/FM/CD/BT Radio, Luggage Rack, Power Locks, Mirrors, Sunroof and Windows. Privacy glass, 21 city, 27 hwy est MPG. TSI model. Beige car with black leather interior. Heated seats, factory powertrain warranty still valid. Keyless entry, AM/FM/CD/ Sat ready. Power windows, locks, driver's seat and mirrors. AC, CD/MP3/Sat Radio ready, Power windows, doors, mirrors, seats. Navigation, BT, steering wheel controls, Panoramic roof, leather seats, tow package, roof rack. Full factory warranty! Full factory warranty, AM/FM/CD Bluetooth ready, cruise control, power locks, mirrors, windows and drivers seat, tilt and telescoping wheel with audio controls. Back up camera, keyless entry and heated exterior mirrors! 4x4, leather driver and passenger heated seats with memory driver seat. 5 passenger cab with running boards, AM/FM/CD, Cruise control, Nav w/ HDD. Tilt steering wheel with audio controls, power mirrors, doors, locks and seats. Fog lights. Come in and check out our brand new beautiful 1 owner!!! AC, Power Windows, locks & seats, Tilt Steering Wheel, Cruise Control, OnStar, AM/FM/CD, Satellite radio ready, collision detection, and much more. Satin Cashmere metallic, AWD, back up camera, keyless entry, push button start, wood grain steering wheel, steering wheel controls, dual zone a/c, leather seating (beige color), dual power front seats, power rear liftgate. Bluetooth, Rear View Camera, CarFax One Owner!, All Wheel Drive, MP3- USB / I-Pod Ready, Sun Roof, Power Locks, Power Windows, Cruise Control, Keyless Entry, and Alloy Wheels. 3LT, Navigation, Third Row Seating, 4WD, Rear Seat Entertainment system, heated seats, steering wheel audio controls, wood grain interior, Bose stereo, remote car starter. AWD, navigation, back up camera, fully loaded and gorgeous. 2004 BMW 325XI - All Wheel Drive! 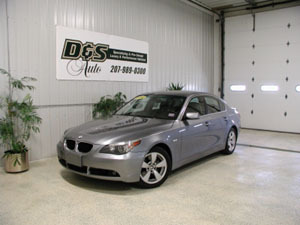 2007 BMW 328XI - All Wheel Drive! Beautiful black on black. Leather, sunroof. Our customer Special Ordered this MKS. He wanted black on black, with the Ecoboost, Panoramic Roof, navigation, and back up camera. He also got this $4,000 below book! We can get anything you desire within your budget. When would you like yours? Special Ordered, S-Line, Black on Black, Navigation, Gorgeous Car! 2007 Infiniti QX56 - Beautiful! 2006 BMW X5 - SOLD!!! Beautiful 1-Owner BMW. Special ordered to our customers specifications, full factory warranty, car fax certified over $4,000 off retail price! When would you like yours? Only 23,500 Miles on this special ordered Lexus RX350. Navigation, Back Up Camera, HID Headlights, Full Factory Warranty. The proud new owners not only got the color combination, mileage, and options they desired, but also saved $5,000 off the retail value! Athleticism & Performance Redefined...When would you like yours? Desire a vehicle with specific features that you can't find anywhere? You shouldn't have to pay full retail for any car, that's why we offer our special ordering. Call us at 989-0300 today to get the vehicle you desire at the price you deserve. This lucky customer special ordered a beautiful 1-Owner AWD Volvo, and with sales tax included was $5,000 below book!!! Another happy customer:) Call us at 989-0300 for all your vehicle needs. 2004 Infiniti FX45 - The Big Boy! Another Special Order and happy customer!! 2004 Cadillac CTS - SOLD!!! 2001 Chrysler Sebring - Inexspensive fun! 2003 Nissan 350Z Track Edition - Wait until you see it in person! Hard to find Track Edition, Gorgeous Blue, 3.5L V6, 287 HP, 6spd Manual, Brembo Brakes, Navigation, HID Headlights, Traction Control, Driver Airbag, Passenger Air Bag, Keyless Entry, Power Windows, Power Locks, Power Side Mirrors. This Track Edition 350Z looks great and is a blast to drive! Beautiful in White! This Jeep is powered by a very reliable 4.0 liters, 6 cyl. engine. 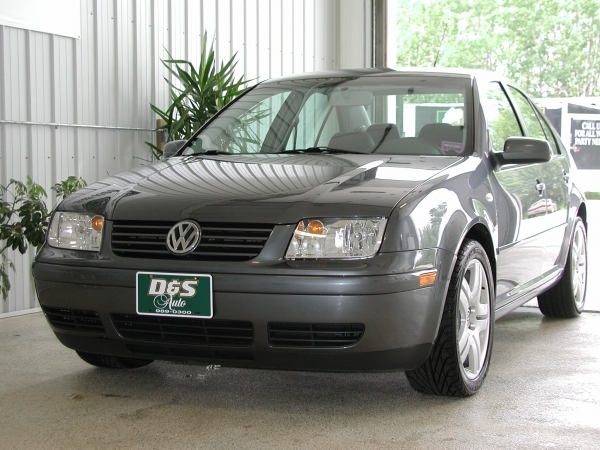 It's fully loaded with, leather, heated seats, dual power seats, sunroof, 10-Disc cd player, & much more. Come in and see just how nice it really is! 2005 Lexus RX330 AWD - Ready for Winter? Great on gas, comfortable, and fast! 2004 GMC Denali - SOLD! 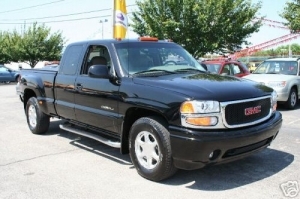 2004 GMC Sierra 1500 Pickup Denali with only 22,000 miles! 2004 BMW 530I - SOLD!